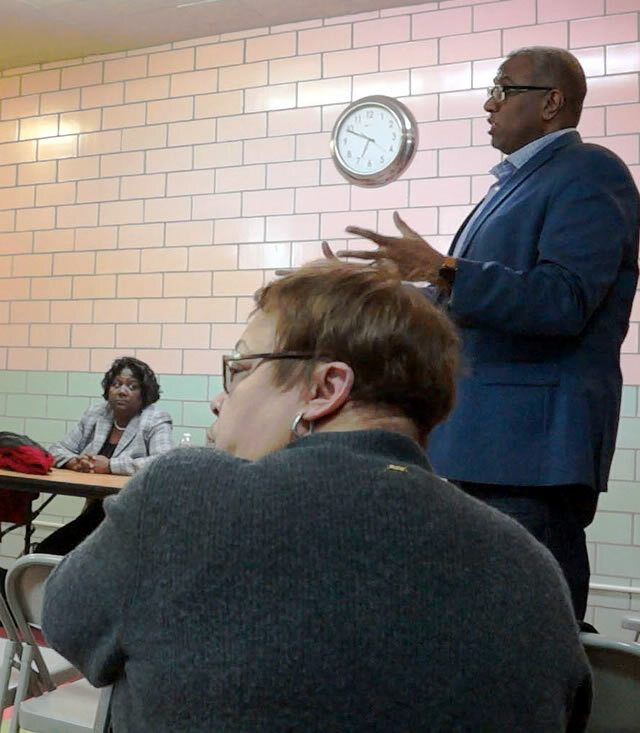 Once again, the alderman of the 8th ward had the opportunity to talk to residents immediately affected by the low-income senior housing she tried to sneak into the neighborhood, but she didn’t show up. 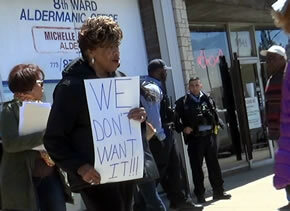 Why is the alderman evading the very people she said she had the support of in the community meeting last week? According to 8th ward staff that attended the meeting, they have been working on this development since 2015, but no one attending the meeting knew about it, except them! If you are new to this, especially Pill Hill residents, what the 8th Ward alderman is trying to do is force a private and publicly owned 7 story, 1-2 bedroom, 134 unit mammoth shadowing over your homes. Unlike the community meeting last week, attended by what looked like most of the residents that lived in the Montclare residence on 78th street. It appeared most of the people that attended the meeting never left the building. Another interesting thing that came out about their waiting list (since last week meeting it has gone from 200 to 400-500 people according to them) was that many of the residents at that location would be coming to the proposed location on Stony Island Ave. You can’t help but wonder how those units were issued out and have a waiting list, and no one knew about it coming in the Pill Hill area. Although this 38.6 million property being developed by MR Properties, LLC, a private owned company in Des Plaines, Illinois, made contributions to several of the current 8th ward alderman’s’ organizations. (You can request a copy of the contribution list for the 8th Ward Alderman) which is approved by the Illinois Housing Development Authority on September 29, 2017. And the community didn’t know about it. When concerned citizens found out about the scheduled zoning meeting, somehow it was rescheduled and staff couldn’t give the community an idea when it would be ready. I might add that three of the alderman’s staff sent to once again attended the meeting to fill in for the 8th Ward alderman were ill-prepared and hostile when they couldn’t answer some important questions, often returning questions with personal questions unrelated to the issue. One of the 8th Ward Representatives, when asked how much of the community property taxes were supporting the TIF money being used with the proposed development, was misinformed that TIF money only came from businesses and not citizens when it does, instead of being given an answer. They obviously showed up with no real data. An audience member also pointed out to the alderman’s staff member that she needed to curb her tone which was way out of line and disrespectful to the concerned citizens in the room. It was also pointed out to the 8th Ward alderman’s office by an audience member that people want to protect their life investment, and they should understand it. “Something is amiss here. Something doesn’t smell right,” was also stated by an audience member. 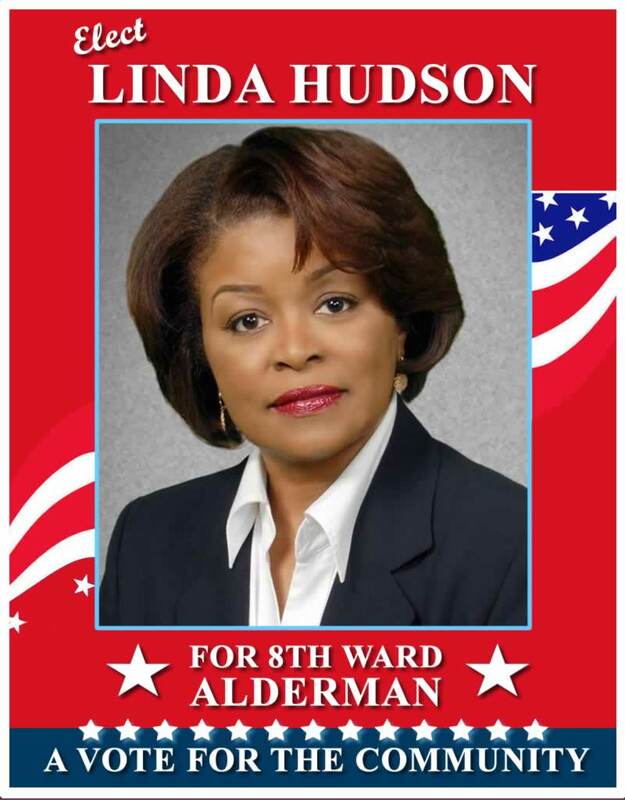 There is an obvious lack of transparency on the alderman’s part, and it was also discussed that there may be some issues with an alderman that runs unopposed to not look out for the good of the community. It was pointed out by another audience member that it was important to develop a community for young families, including the types of businesses they like to frequent to help develop the community. They have the buying power. There was a lot of enthusiasm on the part of the alderman’s staff to keep discussing issues that had nothing to do with what the residents were there for which ate away valuable discussion time. 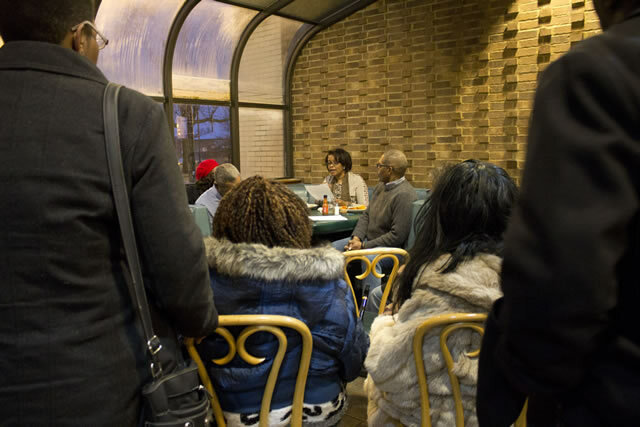 Concerned Citizens stressed the importance of scheduling another meeting with the alderman because she did not attend the other two meetings the organization had invited her to attend, but stressed that they didn’t want the alderman to hold any more meetings at any senior housing complexes. “No career type jobs will be created so young people can continue to live in the community” said Jerry Brown. A young man at the meeting asked why young people had been excluded from the meetings to make decisions about what takes place in the community. And the whole room was fed up with the alderman’s exclusions and lack of transparency, mentioning that the office needed to be monitored because a lot was probably going on with the community not being included. 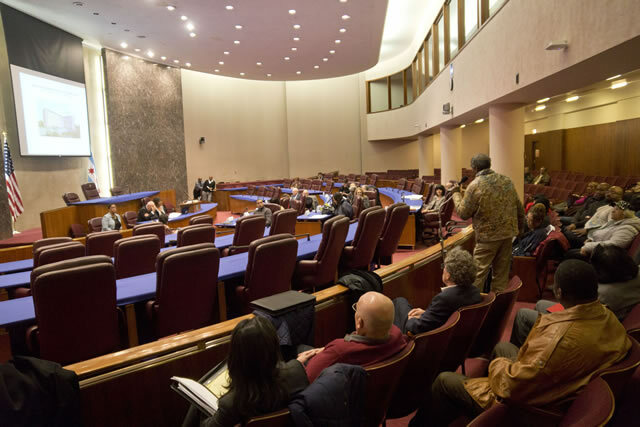 The question was raised about eminent domain, would it be used to seize homes to alleviate traffic issues if necessary that will be caused by cars coming off the highway from under the viaduct at a high speeds on Stony Island Avenue at 94th street. 99.9% of people at the meeting were totally against the development coming to the community, and said they would fight it. Someone asked why the community wouldn’t be included in decisions about what comes into the neighborhood, and the answer was they were. The room was met with responses that it didn’t include the immediate community, and why would the whole 8th Ward make a decision about a part of the Ward they don’t live in, and won’t come directly in contact with? 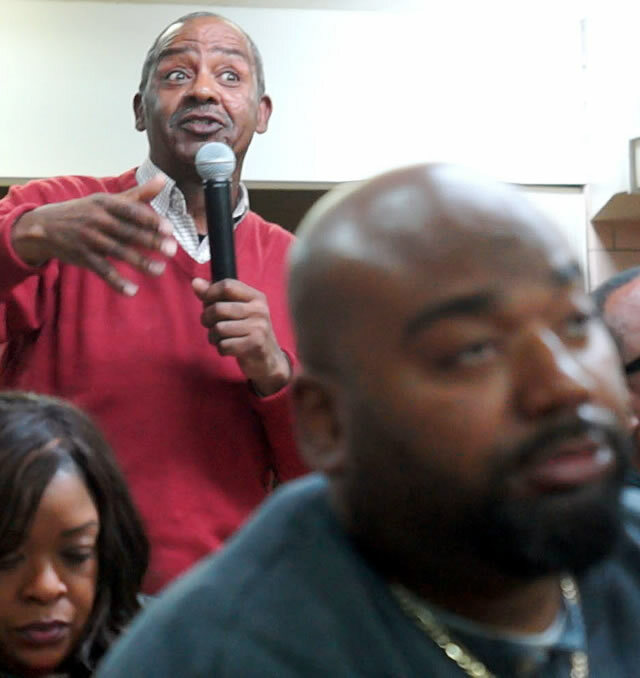 Jerry Brown, a concerned citizen and community activist who lives in the 8th Ward community, stated that he will be paying for a precinct survey, out of pocket, for the proposed location. He also pointed out that public and private money will be used; that CHA is providing subsidies for this project, and the Chicago Low Income Trust is also providing money. Low Income Housing Trust can provide units that could be made available for homeless leaving shelters, homeless people, people leaving drug facilities, etc., to live in the building and was agreed to by the 8th Ward Alderman’s staff that it is true. If you are concerned about these developments taking place around your homes without your consensus, the Concerned Citizens of the 8th Ward is asking that you attend the following meetings to voice your concerns about this project taking place in your neighborhood without your input. Please come out and support the people that have been fighting for you to keep your community a family and business area; and let the Community Development Commission and Chicago Planning Commission know our community is not up for grabs. There will be buses provided by the Concerned Citizens of the 8th Ward for people that need a lift downtown.